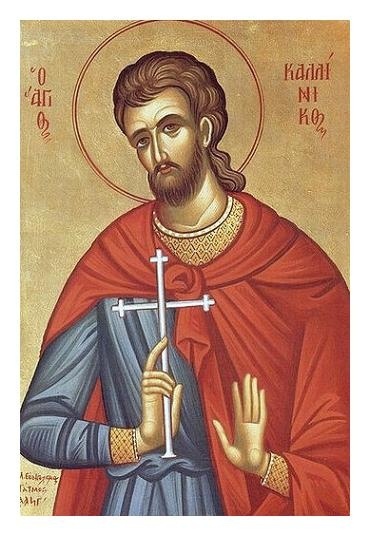 In his suffering, O Lord, Thy martyr Callinicus received an imperishable crown from Thee, our God; for, possessed of Thy might, he cast down the tormenters and set at naught the feeble audacity of the demons. By his supplications save Thou our souls. The beautiful things of heaven hast thou now inherited as is meet; for, greatly aflame with the love of Christ, thou didst manfully brave the fire therewith, O Callinicus. Standing now before Him, cease not to pray in behalf of us all. ➢ This is the last week that the parish will be accepting donations to give to the Magdalene Home (a resource for homeless pregnant and parenting teens). We are hoping to be able to send them $300. The Dormition Fast begins on Wednesday. Please try to observe the fast to the best of your ability. On August 1st the Church remembers seven brothers, the Maccabees, and their mother Solomonia. She had to witness the brutal deaths of all her beloved boys, but the way she did it is memorable. Antiochus IV, who reigned from 175 to 164 B.C., was the Syrian king so full of pride that he took the title “Epiphanes” and felt entitled to demand that his whole kingdom follow one set of customs—those of the pagan Greek culture. What this meant for the Jews living under his rule was that they were directed “to forbid burnt offerings and sacrifices and drink offerings in the sanctuary…to build altars and sacred precincts for idols, to sacrifice swine and unclean animals, and to leave their sons uncircumcised. They were to make themselves abominable by everything unclean and profane” (I Maccabees 1: 45-480). While this was intolerable to many Jews, some went along with it so as to escape persecution and get along with the ruler. I Maccabees tells us: “All the Gentiles accepted the command of the king. Many even from Israel gladly adopted his religion; they sacrificed to idols and profaned the Sabbath” (1:41). Antiochus oversaw the desecration of the Temple itself. A faithful priest of the Temple who was in his nineties, Eleazar, was tortured and killed for his insistence on upholding the Old Testament Law. The seven young martyrs remembered on this day were disciples of Eleazar. When the king brought them to trial, they openly declared their allegiance to him, and refused to break the Law of Moses by eating pork. The oldest brother, speaking for them all, challenged the king by asking, “What do you intend to ask and learn from us? For we are ready to die rather than transgress the laws of our fathers” (II Maccabees 7: 2). When only the youngest boy was left alive, Antiochus urged his mother Solomonia to persuade him to give in, so that she would at least have one son left. She pretended to do this, but actually whispered to him that he should show the same bravery his brothers had shown. She was sure they would all, by God’s grace, be reunited. When her youngest defied the king and was killed, she said a prayer and died too. On August 2nd we read the account of the mother of the sons of Zebedee who comes to Jesus and asks Him to “command that these two sons of mine may sit, one at your right hand and one at your left, in your kingdom” (Matthew 20: 21). So we have two mothers, both wanting things for their sons. One seeks honor; the other encourages martyrdom. Yet both women, different as they are, give sons to God for His service, and He accepts them all. Now as Christ’s holy martyrs they ceaselessly intercede for the world. Jesus knows that it is really the two sons themselves who are asking this, and He turns His attention directly to them. He tells them that places at His right or left are the Father’s, not His, to give.